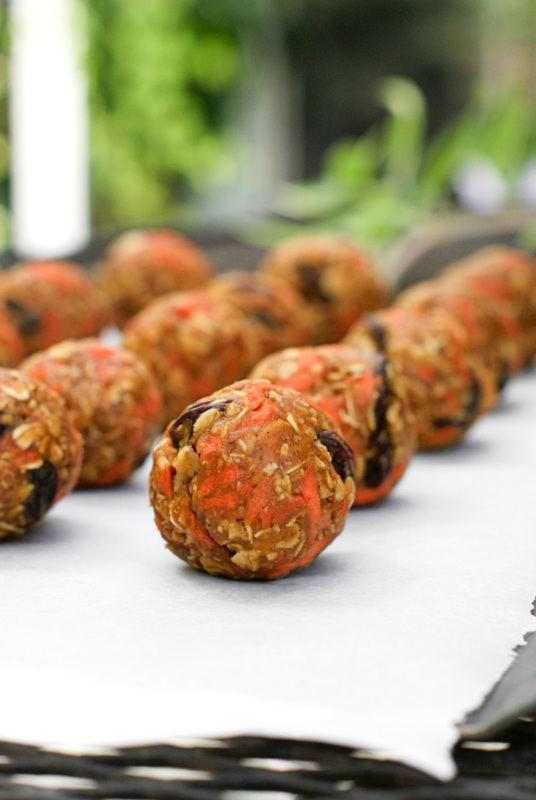 Carrot Cake Oatmeal Bites are no-bake, high protein, low sugar energy balls that feature fresh shredded carrots, raisins, pecans, and all of the flavors of carrot cake. While I'm not overly enthusiastic about dessert, I occasionally get a craving for something sweet. I never eat a ton of sweets in one sitting, but usually only a few bites and my craving is satisfied. That's why these little babies are perfect for me. Each ball is just a few bites of sweetness...the perfect size! Not to mention the fact that they are low in sugar, high in protein, and they boast the flavors of carrot cake! Yes, carrot cake! These energy bites are packed with fresh shredded carrots, crunchy chopped pecans, and plump raisins. Throw in some cinnamon and nutmeg and they are little bites of guilt-free carrot cake deliciousness! In a large bowl, stir together all of the ingredients until well mixed. Using your hands, shape into 1-inch balls. Refrigerate for 1 hour. Serve cold. Store, covered, in the refrigerator for up to 5 days. Nutrition data should not be considered a guarantee. Please see our full Nutrition Data Disclosure. How many carrots in the carrot cake oatmeal bites? The recipe uses 1/2 cup of shredded carrots, packed. I edited the ingredients! Thank you. Can't wait to try this recipe. I made these and they taste like nothing but peanut butter. The recipe that I adapted this from calls for maple almond butter. I used peanut butter because that's what I had on hand and my family didn't really mind the peanut-y flavor alongside the carrot cake flavors. Maybe try the maple almond butter? If you do, I'd love to know if they turn out more to your liking! How many grams of Protein do these have?